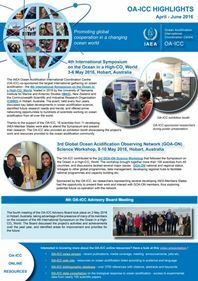 Ocean acidification (OA) is predicted to alter benthic marine community structure and function, however, there is a paucity of field experiments in benthic soft sediment communities and ecosystems. Benthic diatoms are important components of Antarctic coastal ecosystems, however very little is known of how they will respond to ocean acidification. Ocean acidification conditions were maintained by incremental computer controlled addition of high fCO2 seawater representing OA conditions predicted for the year 2100. Respiration chambers and PAM fluorescence techniques were used to investigate acute behavioural, photosynthetic and net production responses of benthic microalgae communities to OA in in-situ field experiments. We demonstrate how OA can modify behavioural ecology, which changes photo-physiology and net production of benthic microalgae. Ocean acidification treatments significantly altered behavioural ecology, which in turn altered photo-physiology. The ecological trends presented here have the potential to manifest into significant ecological change over longer time periods. Microcosm experiments to assess the bacterioplankton’s response to phytoplankton-derived organic matter obtained under current and future ocean CO2 levels were performed. Surface seawater enriched with inorganic nutrients was bubbled for 8 days with air (current CO2 scenario) or with a 1000ppm CO2 air mixture (future CO2 scenario) under solar radiation. The organic matter produced under the current and future CO2 scenarios was subsequently used as an inoculum. Triplicate 12L flasks filled with 1.2µm of filtered natural seawater enriched with the organic matter inocula were incubated in the dark for 8 days under CO2 conditions simulating current and future CO2 scenarios, to study the bacterial response. The acidification of the media increased bacterial respiration at the beginning of the experiment, while the addition of the organic matter produced under future levels of CO2 was related to changes in bacterial production and abundance. This resulted in a 67% increase in the integrated bacterial respiration under future CO2 conditions compared to present CO2 conditions and 41% higher integrated bacterial abundance with the addition of the acidified organic matter compared to samples with the addition of non acidified organic matter. This study demonstrates that the increase in atmospheric CO2 levels can impact bacterioplankton metabolism directly, by changes in the respiration rate, and indirectly, by changes on the organic matter, which affected bacterial production and abundance. 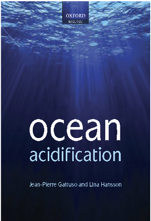 Ocean acidification, the change in seawater carbonate chemistry due to the uptake of anthropogenic CO2, affects the physiology of marine organisms in multiple ways1. Diverse competitive and trophic interactions transform the metabolic responses to changes in community composition, seasonal succession and potentially geographical distribution of species. The health of ocean ecosystems depends on whether basic biotic functions are maintained, ecosystem engineers and keystone species are retained, and the spread of nuisance species is avoided2. Here, we show in a field experiment that the toxic microalga Vicicitus globosus has a selective advantage under ocean acidification, increasing its abundance in natural plankton communities at CO2 levels higher than 600 µatm and developing blooms above 800 µatm CO2. The mass development of V. globosus has had a dramatic impact on the plankton community, preventing the development of the micro- and mesozooplankton communities, thereby disrupting trophic transfer of primary produced organic matter. This has prolonged the residence of particulate matter in the water column and caused a strong decline in export flux. Considering its wide geographical distribution and confirmed role in fish kills3, the proliferation of V. globosus under the IPCC4 CO2 emission representative concentration pathway (RCP4.5 to RCP8.5) scenarios may pose an emergent threat to coastal communities, aquaculture and fisheries. Life in the ocean will increasingly have to contend with a complex matrix of concurrent shifts in environmental properties that impact their physiology and control their life histories. Rhodoliths are coralline red algae (Corallinales, Rhodophyta) that are photosynthesizers, calcifiers, and ecosystem engineers and therefore represent important targets for ocean acidification (OA) research. Here, we exposed live rhodoliths to near-future OA conditions to investigate responses in their photosynthetic capacity, calcium carbonate production, and associated microbiome using carbon uptake, decalcification assays, and whole genome shotgun sequencing metagenomic analysis, respectively. The results from our live rhodolith assays were compared to similar manipulations on dead rhodolith (calcareous skeleton) biofilms and water column microbial communities, thereby enabling the assessment of host-microbiome interaction under climate-driven environmental perturbations. • Ocean warming and acidification individually increased phytoplankton productivity of western South China Sea. • The combination of high temperature and high CO2 showed an antagonistic effect on phytoplankton productivity. • High temperature decreased Chl a concentrations in off-shore waters at ambient CO2. • High CO2 level increased night respiration in the coastal waters at ambient temperatures. Coastal and offshore waters in the South China Sea are warming and becoming acidified due to rising atmospheric levels of carbon dioxide (CO2), yet the combined effects of these two stressors are poorly known. Here, we carried out shipboard incubations at ambient (398 μatm) and elevated (934 μatm) pCO2 at in situ and in situ+1.8 °C temperatures and we measured primary productivity at two coastal and two offshore stations. Both warming and increased CO2 levels individually increased phytoplankton productivity at all stations, but the combination of high temperature and high CO2 did not, reflecting an antagonistic effect. Warming decreased Chl a concentrations in off-shore waters at ambient CO2, but had no effect in the coastal waters. The high CO2 treatment increased night time respiration in the coastal waters at ambient temperatures. Our findings show that phytoplankton assemblage responses to rising temperature and CO2 levels differ between coastal and offshore waters. While it is difficult to predict how ongoing warming and acidification will influence primary productivity in the South China Sea, our data imply that predicted increases in temperature and pCO2 will not boost surface phytoplankton primary productivity.